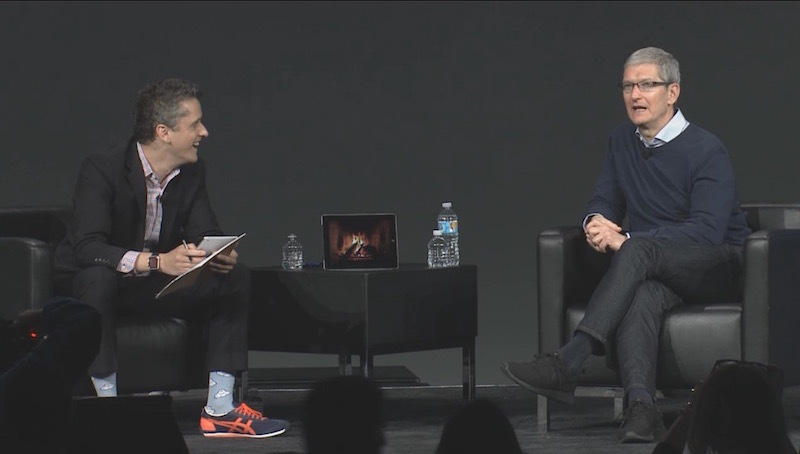 Apple CEO Tim Cook is participating in a "fireside chat" today with Box CEO Aaron Levie at BoxWorks 2015, following Apple's record-breaking iPhone launch weekend. Given that this is an enterprise conference, the interview naturally begins with a discussion of Apple's enterprise efforts, although Cook notes that to some degree there is no such thing as an "enterprise phone" any more than there are enterprise cars and that Apple has been quietly numerous phones and tablets to companies. Cook does, however, highlight some of Apple's enterprise partnerships, including Cisco and Box, emphasizing how transformational mobile is for businesses. Mobility enables significant increases in productivity and gives companies the opportunity to rethink their business processes. But nobody, including Apple, is way out in front on this. Levie then gives Cook a "layup" question, asking why this sort of transformation can't happen on Android, with Cook responding that users want to use the best hardware with security built in from the start and a unified ecosystem. Talking about ecosystem growth, Cook talks about how iOS has pulled the Mac along for the benefit of both operating systems, emphasizing the smooth transition between devices enabled by Apple's Continuity features. "We think people want some similarity, but clearly these operating systems are different things. So we have no intention to blend them." Turning to partnerships, Levie and Cook discuss how Apple is working with former rivals like IBM and Microsoft to deliver better solutions for customers, something that will definitely benefit enterprise. Pointing toward Microsoft's Office demo at Apple's media event earlier this month, Cook notes "Apple and Microsoft can partner on more things than we can compete on. And that's what the customer wants. [...] I'm not a believer in holding grudges." With Apple's strong financial performance of nearly $200 billion in revenue over the past year, Levie asks why Apple doesn't just "throw down the mic" and declare victory, Cook notes "we haven't started yet," pointing to potential in enterprise, Apple Watch, television, and more. Building on Apple's new iPhone Upgrade Program, Levie jokes that Apple should create a subscription program where users automatically get a new iPhone, iPad, Mac, Apple Watch, and more every year. Cook gets a laugh out of Levie's proposed pricing of $64/month, but notes how the iPhone Upgrade Program is designed to remove a lot of the friction of the buying process. The conversation then turns to equality and other issues, with Cook noting it's something Apple and its customers care about and it's something Apple is going to "evangelize" about all over the world. "It's shocking to me that we're in 2015 and we're even having this subject." Cook also points to public education and the environment as areas of emphasis. Moving on to Dr. Dre and Beats, Cook notes he and Dr. Dre haven't talked enterprise issues, but he takes the opportunity to push Apple Music, noting "there's a lot of joy coming out of Apple Music." Levie asks about the possibility of enterprise radio, and he and Cook begin spitballing ideas for a mix of music, talk, and news. With that, the interview wraps up Cook and Levie leave the stage, kicking off the remainder of the conference. "clearly these operating systems are different things. So we have no intention to blend them"
"Apple and Microsoft can partner on more things than we can compete on. And that's what the customer wants." That's a nice way of thinking. How about partner with Crapdroid and release iMessage there? I really want to ditch WhatsApp but most of my friends are stuck on Android. I'm so pleased Apple have the vision, foresight and appreciation of user experience to not go the gimmicky route of touchscreen laptops. I think they're practically the only company I know of not to do so. Hope it stays that way. I think this is a very logical and sane way to approach computing for now. An iPad Pro is NOT a Mac. there is no such thing as an "enterprise phone" any more than there are enterprise cars and that Apple has been quietly numerous phones and tablets to companies. Apple can't declare victory yet, at least not where I work. The IT people there are still solidly Windows (stuck in the past with Windows XP) and the majority of them still hold the opinion that Apple makes overpriced crap that's incompatible with anything but their own products. (Their only concession is that Macs "are good for graphics".) Basically, most of the IT decision makers are living in the 1990s and can't see where technology is going, and don't really care. They're more invested in defending their limited knowledge base. I wish that was a situation that Apple could fix. But I think it's just a matter of waiting until those people retire and new more open-minded IT workers take their place. Until then, it will be a struggle for Apple to make inroads at my institution. I hate the trend of larger phone screens and smaller laptop screens. I've been wanting a 20" MBP for many years and still cling to my 2011 17" MBP. LOL Seriously?? Well tell that to BlackBerry who was very successful for many years in the enterprise sector and dominated it with a standard phone. I hope you don't believe the enterprise sector really needs a file system with mobile devices? Get your thinking away from the Surface Pro. That device certainly hasn't done much to penetrate the market. What is it with people and their file system obsessions? Not sure how Apple is going to have more enterprise presence when their mobile devices don't even have a proper file system. Pretty pathetic, really. The guy with the sneakers looks like a wretched idiot. I like Tim Cook. He has grown into a more well rounded leader than when he first took over. Perfect...no. But even Steve was not perfect (Lisa, Cube, Newton, etc.). And I really like that at least for now, no plans to merge Mac OS with iOS. Sure, they can borrow from each other but they ultimately serve different purposes.